At some point during your research you will come across a brick wall. You will be happily adding events and people to your tree when suddenly you hit a dead end and no matter what you do you can't move on. 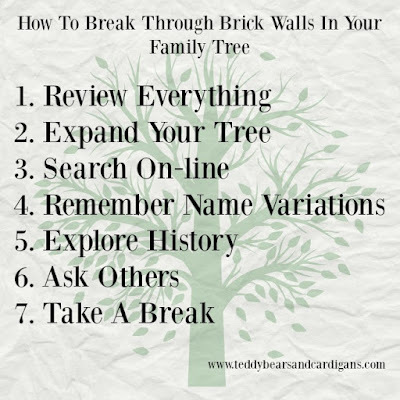 Here are some tips that will show you how to break through brick walls in your family tree but first, what is a brick wall? 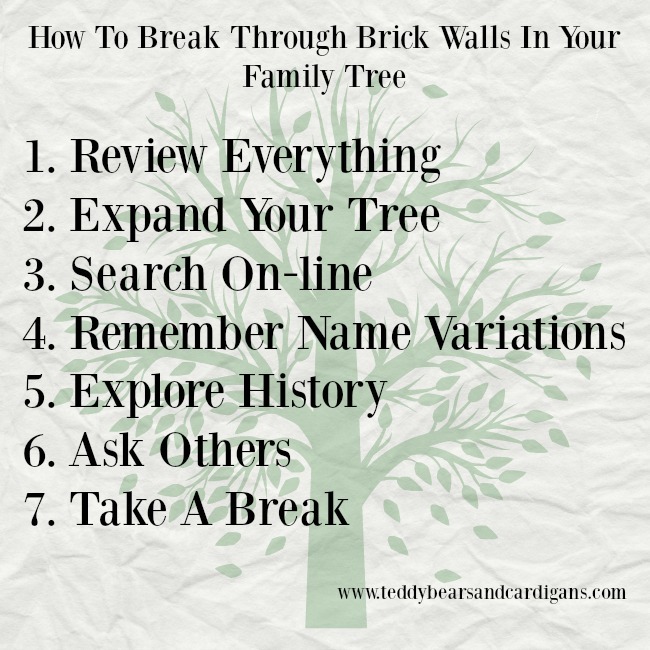 A brick wall can be anything from no information at all about the family or individual you are researching or just too much. Suddenly the individual or family disappear or there are too many people with the same name. There's nothing like having a John Smith from London, England to stop you in your tracks. I read somewhere that family history is part history and part mystery. The brick walls that we hit bring out the detective in us and makes it fun. I love becoming a detective, gathering the clues and solving the puzzles. You will too. When you've tried everything and are stumped what should you do? How do I know this? Could it be wrong? Is it original or a transcription? Could it be interpreted any other way? Look at the evidence you have. Could you have missed something? Do you understand what the document is and what is written? Check that the information you have is correct, that the details are consistent and if one fact was changed could this be your breakthrough? Just one error can send you down the wrong line or stop you in your tracks. Check the dates. Maybe you have skipped a generation or are looking at a sibling not a parent. If there is a large gap between the births of children maybe some were missed or if their births are very close together, less than nine or ten months, maybe they aren't siblings at all. Expand your tree to include siblings, cousins and in-laws. These may give you enough clues to allow you to carry on. Do any of the siblings have unusual names, can you trace them? If you can't find a birth certificate for your ancestor can you get one for a sibling? Maybe yours was born before 1837 but they have a younger sibling born after. Check documents once more looking for more clues. Check who witnessed any marriages or who reported any deaths. Can you identify these people? In the census who were their neighbours? Are they related? Don't rely on just one or two online resources. Familysearch.org is free and has hundreds of entries. They also have original images of some of their collections. Google the name with a date, sometimes this will bring up mentions that you can research further. My library membership allows me to access newspapers online at home for free. Does yours? Search for other family trees that may give you a hint or two, never take as fact other trees without checking each event yourself. Have you checked every variation for your missing person? They may be listed under a nickname, abbreviation or a middle name. If you are searching a online database and getting nothing put less information in. Just one name, date and place of birth. Most databases will accept wildcards so instead of the full name just put the first three letters and a* so instead of Phillips put Phi*. Not sure if they were Smith or Smyth? Enter Sm?th. At the beginning I said family research was part history. Read events around the time your person disappeared. Many Irish people emigrated to the USA to escape the famine in the 1840's and again in the late 1880's and early 1890's after the Plan of Campaign. Find out what was happening locally too, many people from rural England were transported for being involved in the Swing Riots in the 1830's. Not everyone fled abroad but they may have relocated to another part of the country and even if they appear on census returns their place of birth may be unfamiliar to the enumerator and written down incorrectly. Ask on genealogy forums and message boards. Other family tree researchers are more than happy to help and will share the information they have. Many will even look things up for you in local archives or transcribe gravestones in their local cemetery. Don't forget to ask family members or their close friends/neighbours too. Brick walls can take years to breakdown, only when a new collection goes online may the break through you need happen. Research another branch. Stay away long enough to "forget" how you managed to get to that conclusion, sometimes it's there and you just can't see it. You can pin the above or save it for a quick reference guide and whatever you do, enjoy your research and don't give up. Like to read more tips for beginners? Then just click on the tree below or the Family Tree tab above. 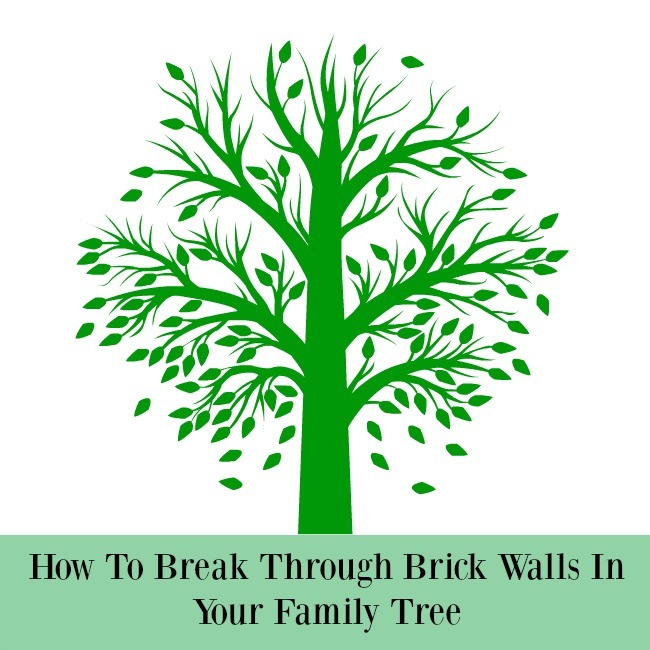 Do you have any tips on breaking down brick walls? I'd love to read them in the comments as I have a few myself I'd love to crack.